People had been milling grain at the Bazacle, a natural ford on the Garonne river in Toulouse since at least 1071. In 1369, the mill owners who shared a perpetual lease on the river signed a profit-sharing agreement. And in 1372, after one of their number was about a decade late in repaying a debt to a merchant, what’s likely one of the oldest creditor/shareholder lawsuits of all time (pdf) led to a corporate structure that lasted centuries. The lawsuit has had lasting impact because it was the likely reason for the creation of a structure where bailies (essentially a board of directors) were elected at an annual meeting to be able to make decisions without consulting shareholders each time, and because the suit acknowledged the company as a legal entity distinct from its shareholders. It’s that governance and shareholder protection that set the Société des Moulins de Bazacle apart from earlier Italian sea-trading and banking companies. The share price and structure that the founding families agreed on after the lawsuit form the first data points in a fascinating six-century-long data set researchers have constructed for a new National Bureau of Economics paper. (paywall) The paper by David le Bris, William N. Goetzmann, and Sébastien Pouget chronicles the story of a remarkably consistent and sophisticated business, with active and rational stockholders, that thrived for longer than many countries have existed. Despite the fact that no one formally defined ideas like discounting to present value and risk adjustment for centuries, shareholders acted largely as asset-pricing theory would expect them to. The Société des Moulins de Bazacle survived fires, dam-destroying floods, ice floes, plagues, famine, and revolution, all while paying out 100% of its profit in dividends to a changing group of shareholders. It managed to successfully transition from mill to hydroelectric utility in 1888, and listed publicly on the Paris stock exchange. What eventually did it in wasn’t mismanagement, but the fact that the French government nationalized it along with every other utility in the country in 1946 in the aftermath of World War II. The hydroelectric plant still exists, albeit under state ownership. Shares in the Société des Moulins de Bazacle were called “uchaux,” and were freely transferable without the company’s involvement. Revenue came from a 1/16th fee on grain milled, and all profits were disbursed to shareholders through a periodic dividend called a “partison.” Shareholders paid a periodic “talha” for upkeep and investment. If they could not, their uchaux reverted to the company. It was private and profit seeking. There were shareholder audits of the company’s books. Investors didn’t directly manage the company except through its board of directors. Directors were appointed by shareholder vote at an annual meeting. It had limited liability, and was treated as a legal entity distinct from shareholders as early as the 14th century. By the 1500s, the company had a COO, treasurer, and clerk. The data are remarkably complete. 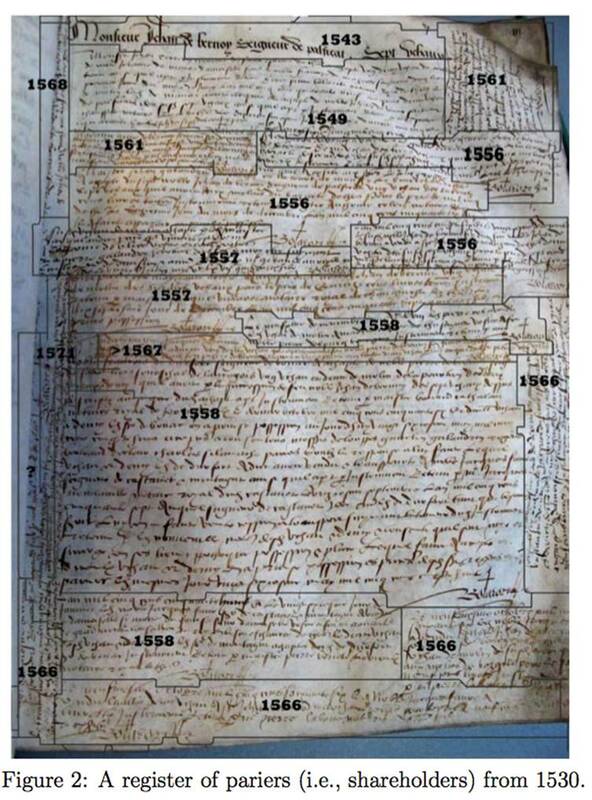 Researchers were able calculate the dividend paid out for 417 years of the firm’s history because it kept meticulous records. 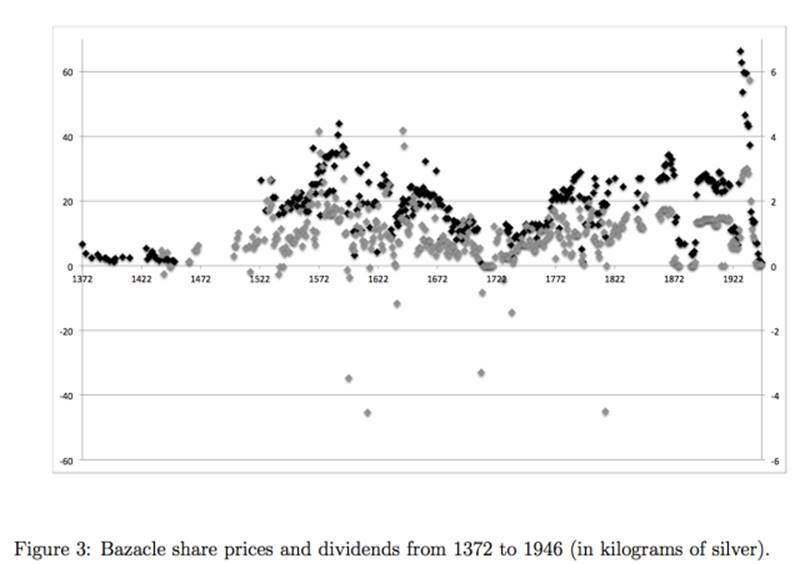 And fiscal registers from Toulouse and accounts in newspapers let them construct a 364-year data set on share prices. The Société des Moulins de Bazacle is a great test for finance theory because of its long existence, and the relative lack of major technology or governance change over that period. The dividend policy of paying out everything each year helped the researchers create a model without having to deal with smoothing, where companies try to pay out a constant dividend despite negative shocks or changes in profitability, which makes analysis tougher. Things like war, plagues, and famine over the history of the company also provide some pretty good macroeconomic shock data for the researchers to work with. The company suffered its share of catastrophes, including a flood that destroyed the dam in 1638, and ice floes that did the same in 1709. A fire that burned down the mills in 1887 led to the transition to a hydroelectric utility. To give a sense of how active the market for its shares was, the researcher also charted out how often shares were traded. 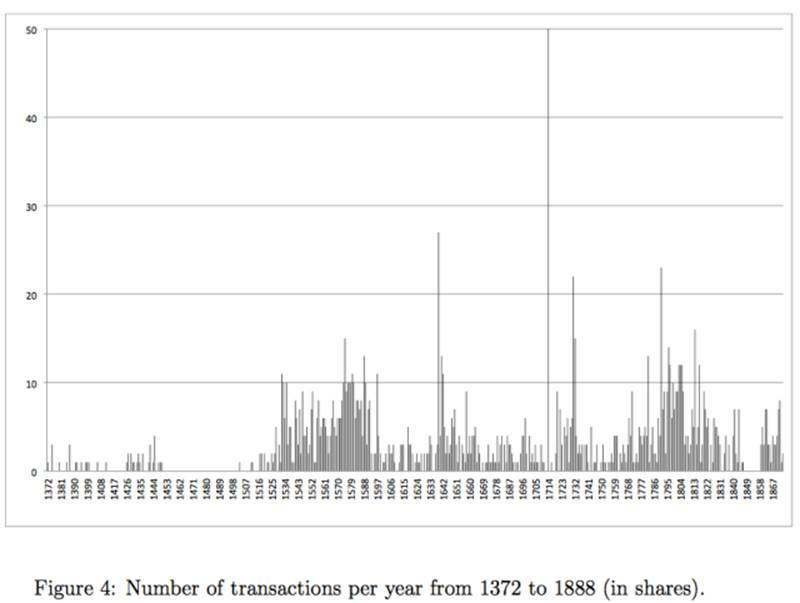 In the early years, transactions were relatively rare. But there were several years in which more than one-fifth of the company’s shares changed hands. By modern standards, that’s relatively low-volume trading. But it’s remarkably active considering that this was the first company of its type, and evolved its own structures and market independently. Another thing that limited transactions: an unusual transaction tax. A new shareholder had to not only pay a substantial notary fee, but host a dinner for the entire board of directors to display the notary act of his purchase. One interesting conclusion of the new paper on the company is that shareholders naturally behaved the way asset-pricing models would predict. Share prices responded to variations in dividends and dividend shocks, macroeconomic variables, and fluctuation in grain prices. For example, after the ice floes completely destroyed the dams in 1709, the company share price dropped to reflect lower expected dividends because it would take years to rebuild, and the money would come out of shareholders’ pockets. Many couldn’t pay the talha for the repairs and forfeited their shares, and the price dropped further. Shares were usually worth some 20 tons of wheat, but fell to 0.76 tons of wheat. It took an engineer stepping in and buying half the shares to recapitalize the mill.